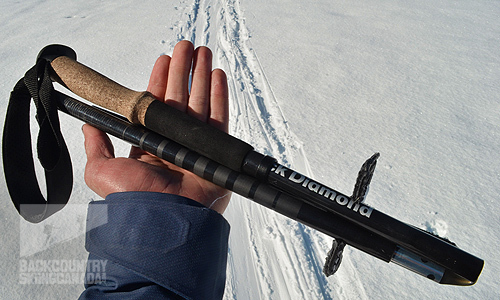 The Black Diamond Alpine Carbon Z-Pole is a 4 season pole that will keep the minimalist happy. This collapsible pole is ultralight and features improved joint support and overall increase durability. Made with 100% carbon fibre, the sections are connected via a Kevlar® centre cord which is protected with flexible tube ends. 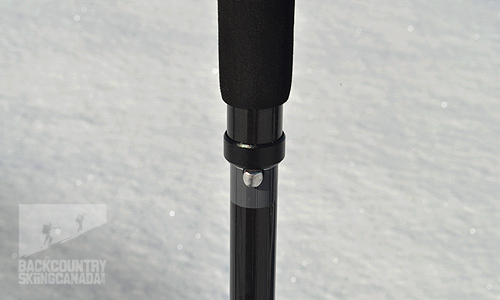 The pole is topped with a cork handle and non-slip EVA foam mini-grip. 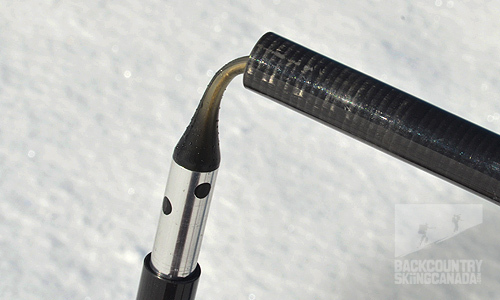 To pole deployment system is inspired by avalanche probe technology; by pulling the first section away from the grip, the pole snaps together and locks into place. The aforementioned flexible tube ends form Speed Cones which guide each pole section together. The addition of aluminium rings and sleeves at each speed cone adds further robustness to the connection. Simply pressing a small button releases the tension and the pole can be collapsed. A Flex Tech Tip allows you to swap between carbide or rubber tips, and the poles come with both powder baskets and trekking baskets. 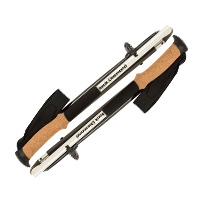 The handle also features breathable, moisture-wicking wrist straps. I really like the Z-Pole Rapid Deployment System, and these poles are so very light. These are definitely the lightest pole I have ever picked up, and the cork handle is both grippy and soft on the bare hand or glove. The Z-Pole system is so fast to either deploy or stow, which can make a big difference when you’re transitioning often. 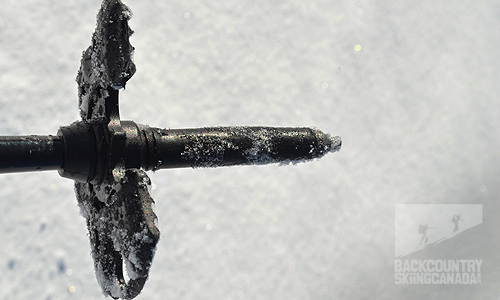 The tradeoff is a pole that doesn’t feel all that bomb-proof. When in use, the joints at each section have a small amount of play in them; not enough that they move much, but if one was to shake the pole, movement can be felt. The plus side to this is that all the materials used are super strong, so while it feels a bit vulnerable, it’s still a very strong pole. All in all, I really like these poles and would suggest them for use any time of the year; the caveat being that one should avoid whacking too many branches on the skin track. Minor play in the joints. Durability of cork grip is questionable. No lower grip option for side hilling. Lengths: 100cm / 39", 110cm / 43", 120cm / 47", 130cm / 51"
​​​Collapsed Length: 34cm / 13.4, 37cm / 14.6", 40cm / 15.7", 44cm / 17.3"